There She Goes is a dramedy about a British family and their trials and tribulations while raising a 9-year-old daughter with a severe learning disability. Based on the real story of creator Shaun Pye’s own family, and his daughter Joey, the series takes a realistic and unapologetic look at the life of this family, their love and frustrations. 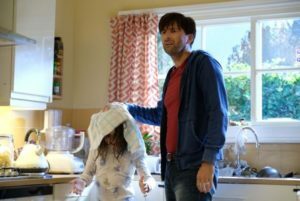 The series stars David Tennant and Jessica Hynes as the parents of Rosie, and her brother Ben, and takes place in two time periods – present day and 10 years ago during the pregnancy and while the family struggle to come to terms with the reality of having a child with a rare chromosonal disorder, and having to listen to people constantly telling them there’s nothing wrong with their daughter, while they are sure the opposite is true. The series aired in the UK on BBC 4 in late 2018, and will be hitting Britbox in the US in April 2019. Creator Shaun Pye, Executive Producer Clelia Mountford, and BBC Comedy Comissioner Shane Allen were joined via satellite by star David Tennant to discuss the series at this year’s Winter TCA Tour. One of the most important things that Pye wanted to be sure about with the series was not to portray the parents as being any kind of heroes. That they be real people, just living their lives. Of course, that’s only thanks to his partner, both in life and in writing the show, Sarah, who helped chart the course of the series. For Pye and Mountford, in producing the series once the tone had been found, was in casting Rosie, the child at the center of the story. According to Mountford, learning disabled children were auditioned for the role, but on the advice of a child psychologist they quickly decided that they couldn’t pursue one of those actors. “[They] actually said it would be far too demanding for such a child because of the schedule and also aping certain behavior like running out into the road, pouring milk over themselves, [and so] it wouldn’t have been advisable to do that,” says Mountford. Enter Miley Locke. Preparing Locke for the role meant many breaks, interactions with Joey, and advice from Pye. There She Goes will drop on Britbox for US audiences in April 2019.